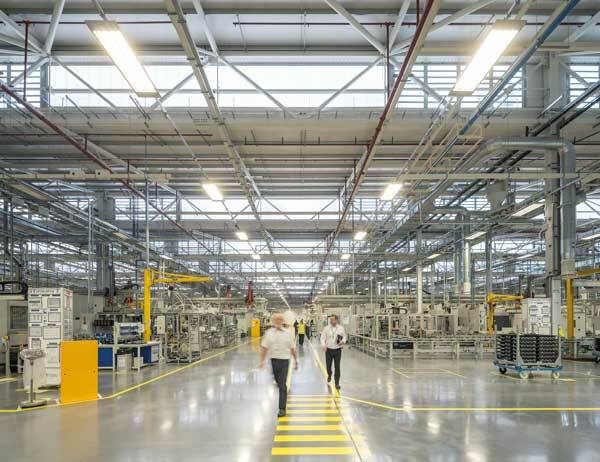 Jaguar Land Rover’s new Engine Manufacturing Centre achieved a BREEAM ‘Excellent’ rating. Which comprises of 165,000m2 of production space, offices, social support areas and a community educational centre making it an exemplar of modern sustainable manufacturing. As the SSDA awards celebrate their 50th year of recognising the best of what the UK steel construction industry can achieve, we celebrate that 77% of the projects feature STRUMIS customers. In this post we will be celebrating Severfield’s involvement in the Jaguar Land Rover Engine Manufacturing Centre project. Innovation, collaboration and the wellbeing of people at the facility are said to have shaped the success of this building. The simple layout of Jaguar Land Rover’s Engine Manufacturing Centre is said to have been derived from optimum operational adjacencies. It was designed for flexibility, providing both an efficient process flow and giving staff easy access to support facilities. Naturally-lit machine and assembly halls are flanked by supporting office and ancillary buildings. This approach optimised production performance and blurred the boundaries between production and offices through visual transparency. The steel design comprises braced steel frames, with grids set by the bay sizes of the production areas below. Concept studies explored grid size with the client and compared the option of a portal solution, however the braced frames were considered the cheapest option. "The steel frame design provided both a flexible structural system and an ordering device from which the façade elements were structured. The steel structure also enabled the light infused machine and assembly halls to be realised,” says Arup Senior Architect Sean Macintosh.